A rug always adds style to a room, whether it's been in the family for generations or chosen with care by its owners. But beautiful rugs are often delicate and need special care from professionals, to keep them in top shape. Here at Manhattan Carpets, we give every rug individual attention, checking each one carefully before we carry out any work. 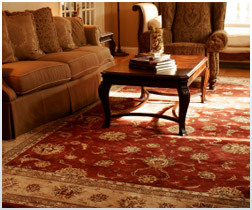 We have experience in cleaning all kinds of rugs, whether silk, wool, Persian or synthetic. We have tried-and-tested methods for removing stains, spots and dirt, and restoring bright colors. We vacuum, wash and groom each rug before letting it dry in a climate-controlled area. We will then return it to you, with our free pick-up and delivery service.